No matter what the sport, uniforms take a beating on and off the field. For school athletic programs looking to get the most out of their investment in uniforms and apparel, thinking about game day rigors from the perspective of a uniform or other piece of apparel is useful when it comes time to make purchasing decisions. 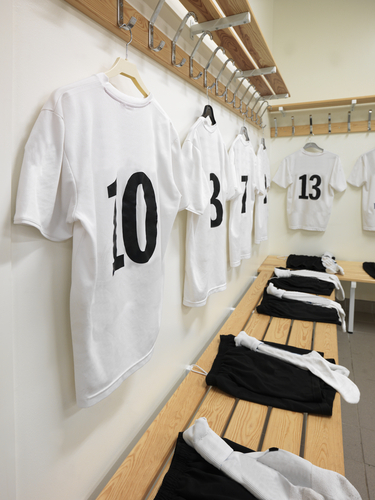 What does a uniform go through on game day and how should that affect how you select and care for your team’s apparel? It’s universal. Football, soccer, baseball, track and field, volleyball; school sports athletes sweat. How well their uniforms manage sweat (politely referred to as “moisture” in scientific circles) can mean the difference between a comfortable game experience and a miserable, clammy ordeal. Technical moisture-management apparel is available from a number of team sports apparel manufacturers. Your team dealer can help you choose the right ones for your team’s needs and budget. Excessive sweat drenching a team uniform also creates a nasty smell and the ideal environment for fungal or bacterial growth. Antimicrobial fabrics combat that and extend the life of your uniforms between washes. Many team sports like football and cross-country are played under almost any weather condition. Rain is almost a guarantee certain times of the year in certain geographic regions. Waterproof and water-resistant apparel is available to help keep your athletes and your coaching staff dry. Your team dealer can explain the difference and help you choose among the options. Even non-contact team sports aren’t gentle on uniforms. Fabric as well as stitching should be chosen carefully to hold up to the rigors of your sport. The team sports buyer can’t afford to waste money on apparel that will fall apart before the season is over. Sometimes it’s worth spending a little more for durable gear than having to replace it down the road. A few spins through the washer and the dryer can be as tough on a school team sports uniform as a grueling game. Technical fabrics, especially, need to be handled with care in the wash so as to preserve their performance capabilities. Again, look to your team dealer for guidance on choosing team uniforms and apparel that are washable and for advice on proper laundering practices. Life isn’t easy for school team uniforms. But you can help extend it (and therefore, your team apparel budget) by making good decisions. For help with that, download our new guide for coaches, athletic directors, equipment managers, or anyone else involved with team apparel and uniform purchasing. Click on the link below to download.